Apple's move to a 64-bit architecture with the iPhone 5s's A7 processor and iOS 7 could hint at a 13in iPad, an analyst has said. Barclays Capital analyst Ben A. Reitzes said in a note to investors on Tuesday that Apple could be working to develop iOS for a bigger, more powerful, notebook-style iPad that could one day become Apple's second-largest money maker, with the iPhone in the top spot. According to Reitzes, Apple may have launched the iPhone 5s with a 64-bit processor in order to encourage developers to begin populating the iOS App Store with 64-bit optimised apps ahead of a future 13in iPad device. In addition to the introduction of a 64-bit chip, Reitzes also sees the free iWork suite for iOS as a sign that Apple is looking to push the iPad into the notebook market. Reitzes believes that, though it's inevitable that a notebook-like iPad would cannibalise some of Apple's Mac sales, particularly the MacBook Air, it would still benefit Apple because it could eventually take up to 30 per cent of the market. 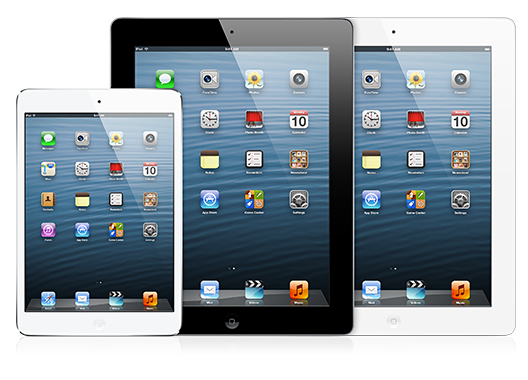 Reitzes envisions that the bigger iPad would cost around $650 (£450). This is not the first we've heard of a possible bigger iPad. Back in July, the Wall Street Journal suggested that Apple had begun testing larger screens for a 13in iPad. It's believed that Apple is planning a 22 October iPad event, where it's expected to unveil the iPad 5 and iPad mini 2, though we don't expect to see a bigger iPad until next year, if at all.